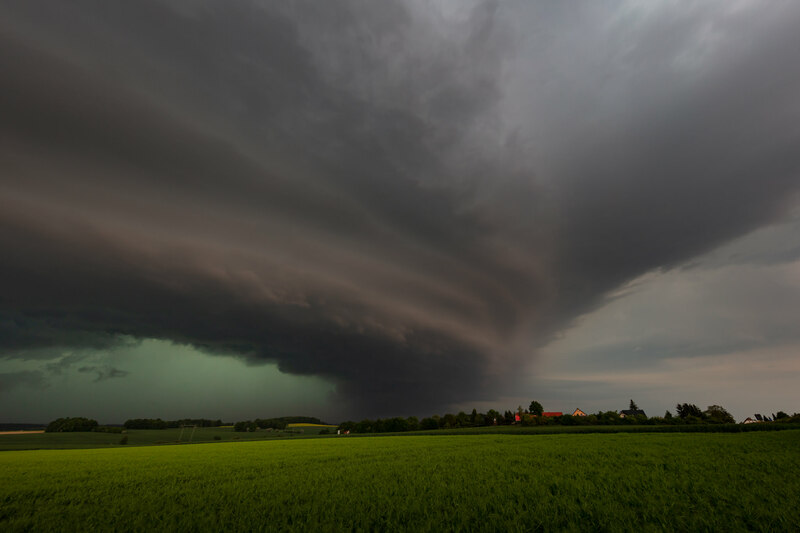 On May 23rd 2016 a stationary front triggered thunderstorms coming from Czech Republic and moving further north/northwestwards into eastern Germany. 2:00 pm (CEST). 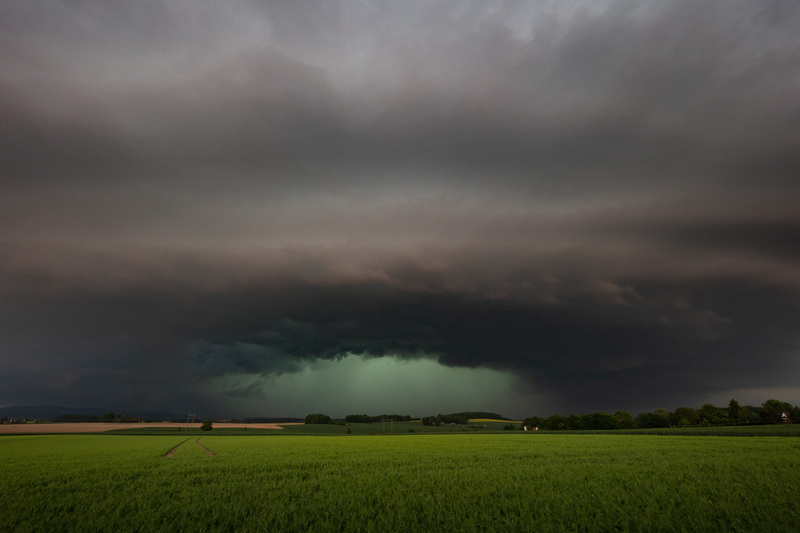 While some first cells had developed in the south of Plzeň in Czech Republic I organized a chase with two friends from my hometown in Jena: Anke Drewitz and Markus Schmidt. 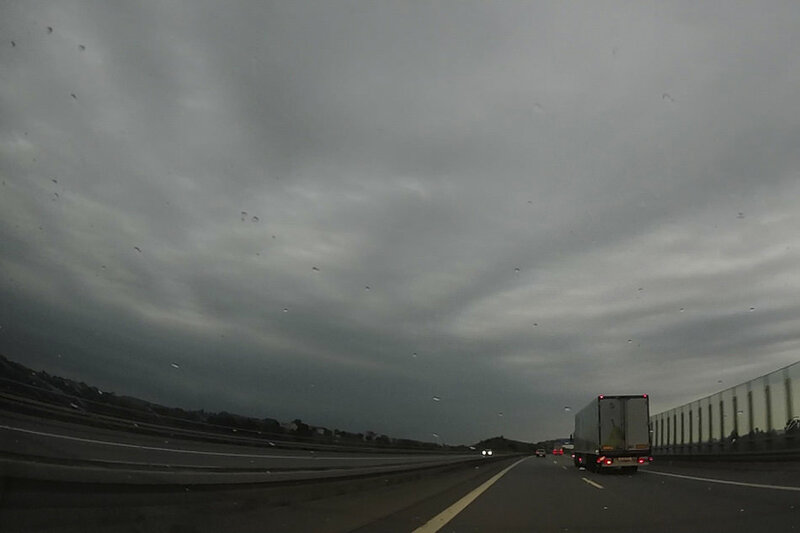 After meeting up with them we hit the road and encountered a cell southeast of Chemnitz. 5:50 pm. 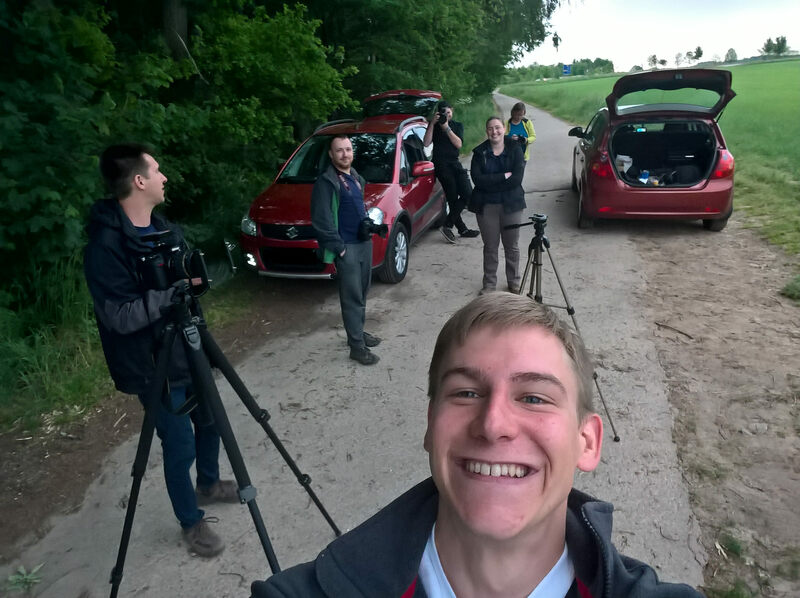 We met Luise, Ronny and Stephan at the Autobahn A4 near Berbersdorf in Saxony. We heard thunder but saw almost no lightnings. All what we saw was Stratus or Nimbostratus – a greyish/whitish wall. Not safe or photogenic at all while the core behind the rain and fog curtain had over 60dbz on the radar. 6:00pm. With the arriving stratiform rain we left the spot and went further east. 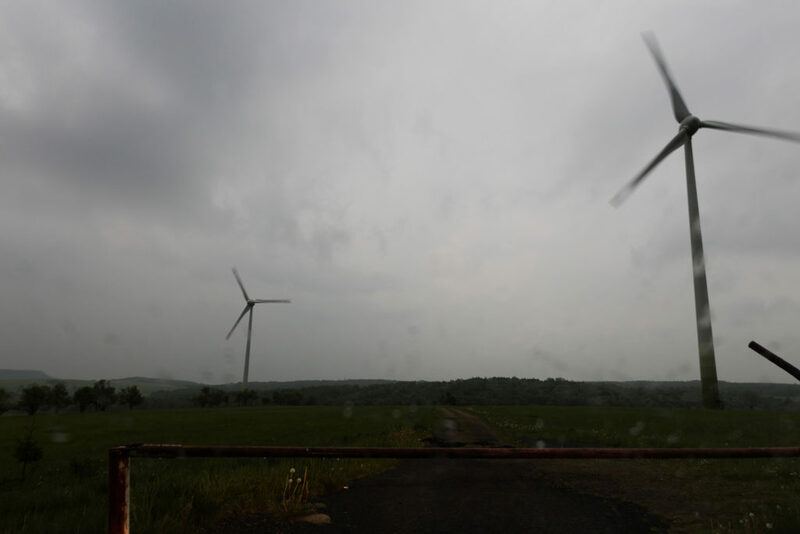 Meanwhile the Czech thunderstorms reached the south of the Ore Mountains. 6:55 pm. We found and interesting road option with the A17 giving us the chance to directly drive into the Czech Republic. 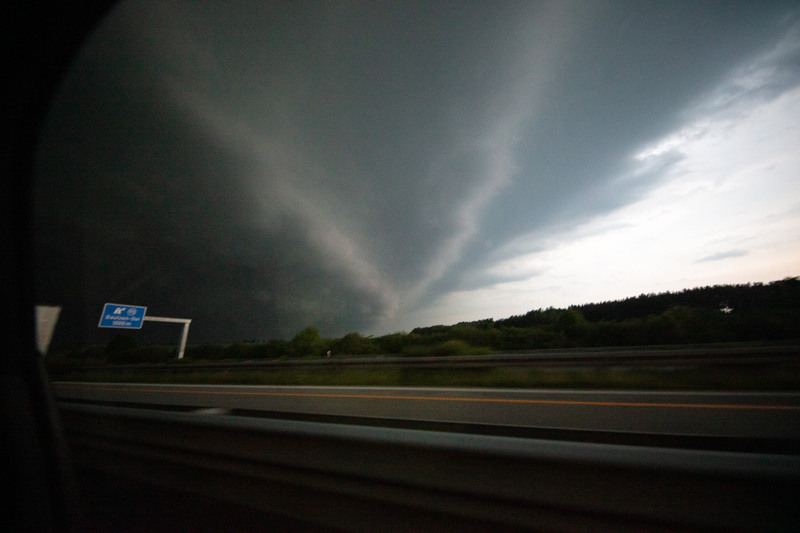 We stopped behind the border near Tisá and looked southwards on that what should be the front of a MCS (Mesoscale convective system) or at least some raincores… disappointing. We made a turn and drove back to Germany for repositioning. 7:30 pm. The cluster to our left showed the first structure with a faint shelf cloud at the horizon. The cell to our right moved over the Ore mountains into Germany and was the strongest one of that further clustering system. In the north of Dresden we had to decide wether to go further north (A13) or east (A4). While discussing the options the nav reported a traffic jam on the A13 (due to roadworks) only seconds before the turnout arrived. That made the decision easy. Unluckily Luise, Ronny and Stephan didn’t hear that and ran into the jam. 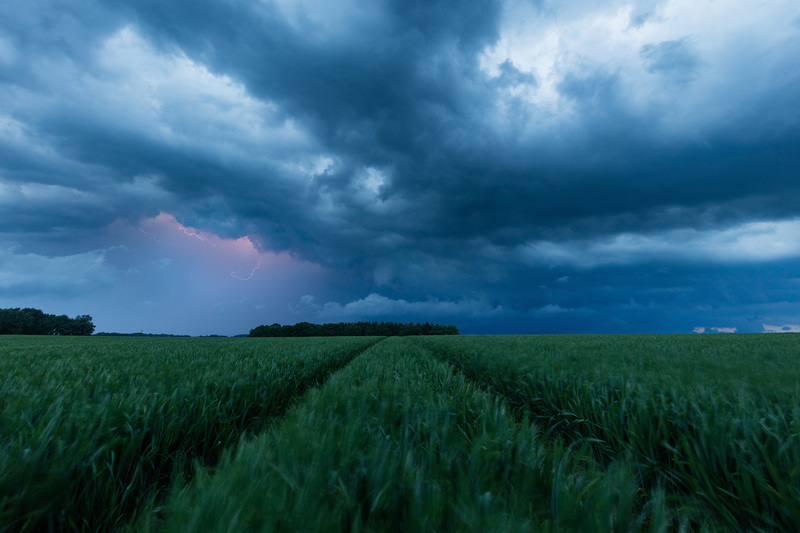 Now we needed to be quick – in order to meet the cell at a point which allows us to go further east as an escape route. 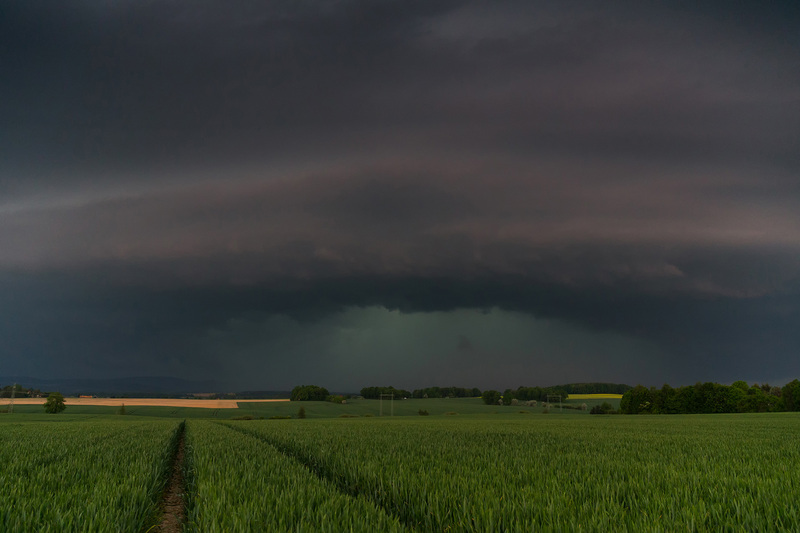 Refering to the radar signature and dBZ that thunderstorm brought big hail to the Saxon Switzerland region. And I wanted to avoid hail dents in my car. 8:00 pm. Shortly before the town of Bautzen we stopped at the exit »Salzenforst« near the village of Bloaschütz. 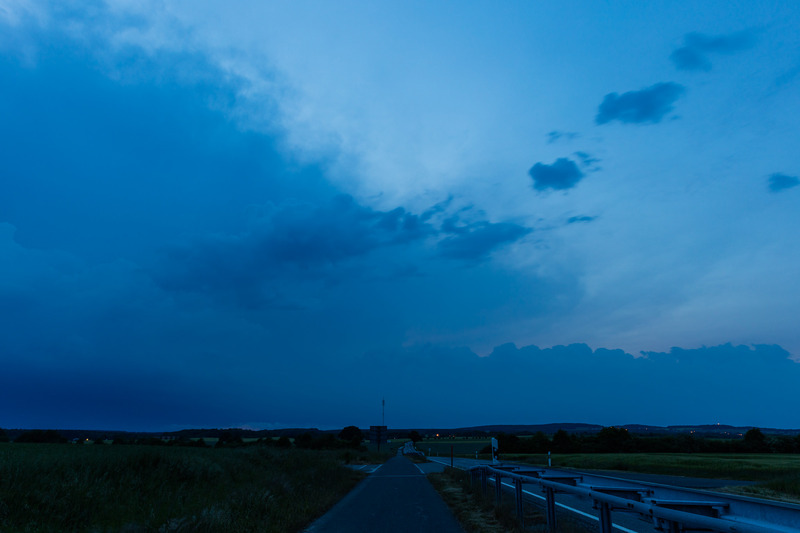 We recognized some blue sky to the east while driving which means the sight became better and more contrasty. Something dark came towards us. 8:16 pm … revealing a greenish-glowing potentially damage bringing hail and rain core. 8:17 pm. Out of this world. 8:29 pm. Now it was time to escape from that monstrous looking cell core. We went further east on the A4. While the cell moved further north-northwestwards dumping big hail between Bautzen and Bischofswerda we could easily flee to the east. Near Weißenberg we finally arrived a tail-end charlie position. Watching a new formation passing by during the beginning blue hour. The chase ended with some lightning exposures and three deeply satisfied persons. The MCS moved further to the north. An impressive supply line of towering cumulus led into the system. 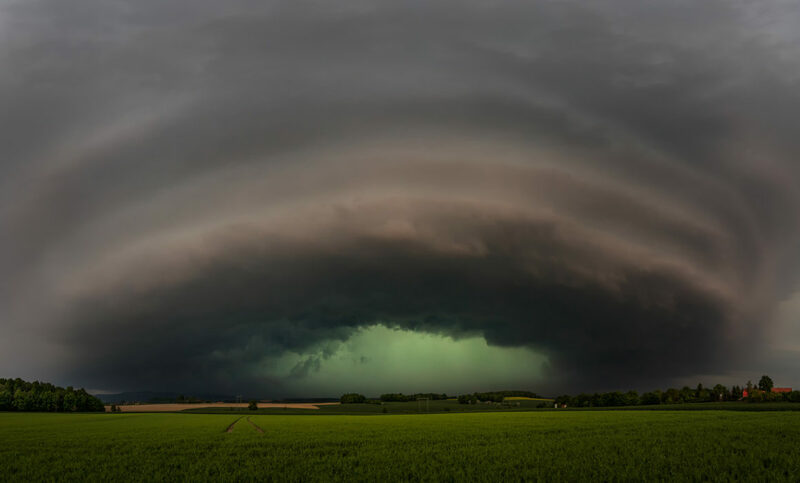 In terms of German Storm Chasing this was one of the memorable events. After almost seeing nothing as stratus this day turned out to be very convincing. Joy or frustration – sometimes it’s a question of how the dice rolls. 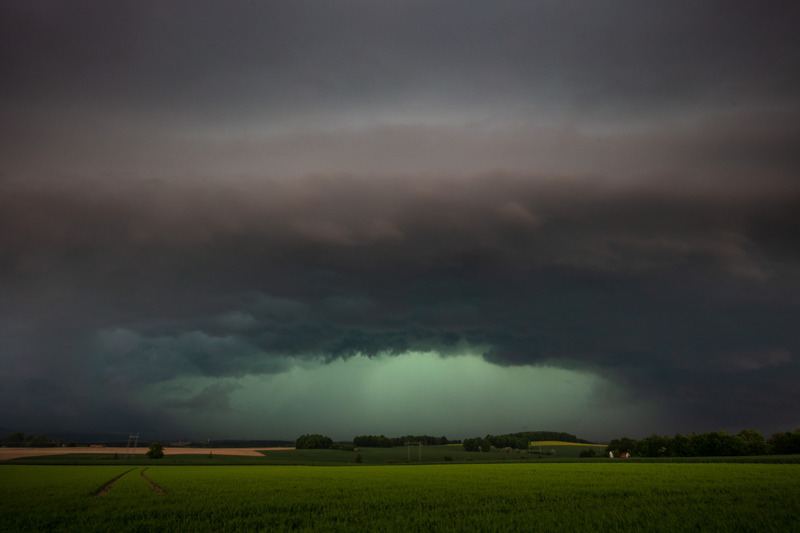 We intercepted a high precipitation supercell living for about six hours (2-8 pm). Concerning media »The Eye« (or German: Das Auge) went viral with over 800 000 views on Youtube and 20k Likes / 8k shares on the Facebook post. 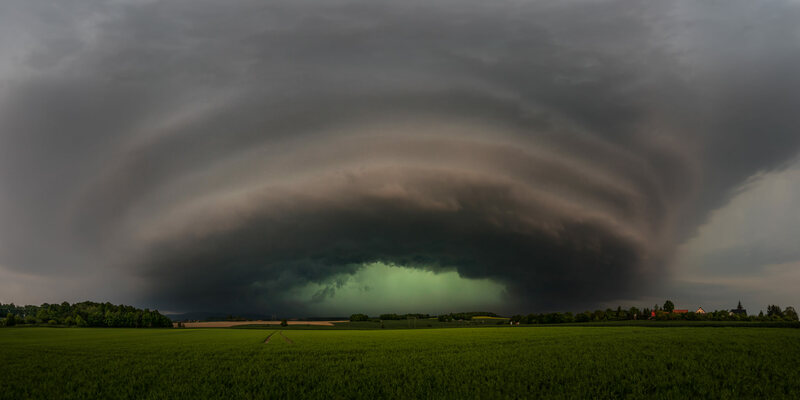 Nevertheless it was a severe thunderstorm bringing locally 40+mm of precipitation and damaging hail (up to 5cm in diameter) to parts of Saxony (see some of the damage photos which have been sent to me in my post at Thüringer Storm Chaser e.V.). I have to admit, I like photographing and witnessing mother nature’s dramatic phenomena. 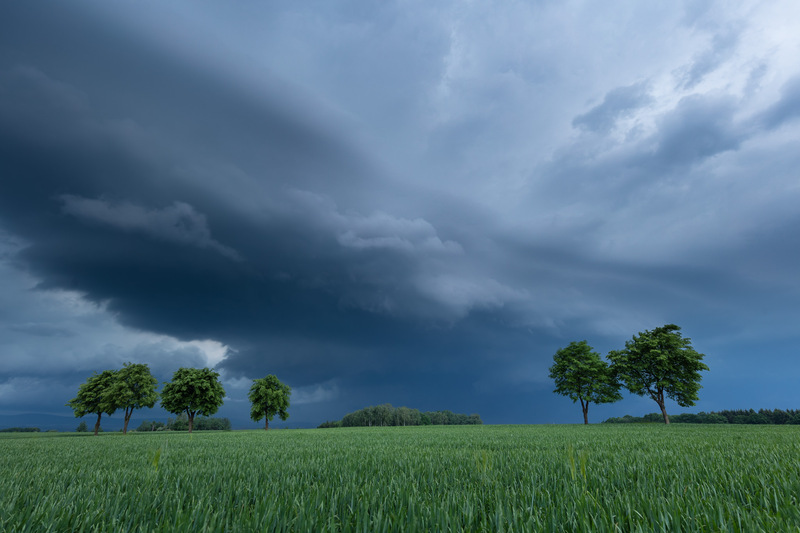 But as long as the local population is suffering from those damages our reports, documentations, information on severe weather and how to adequately react is the most important aspect of Storm Chasing.